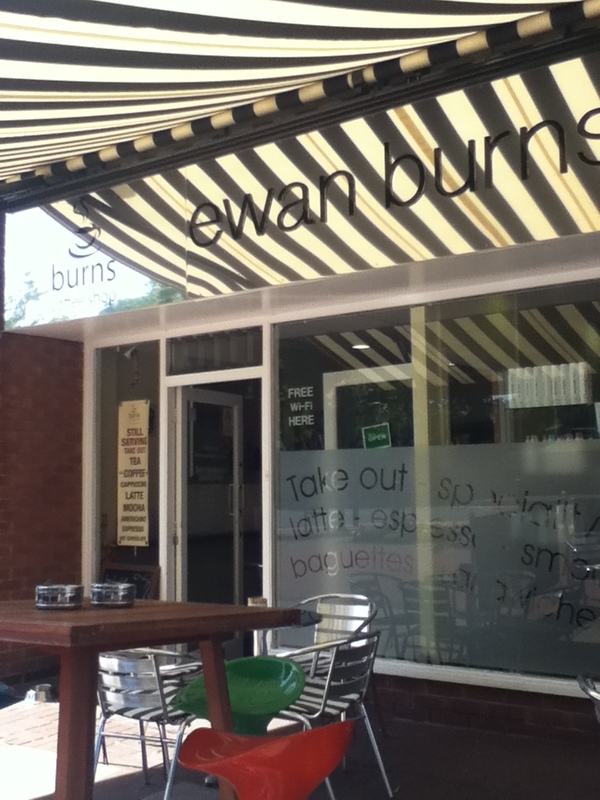 Ewan Burns café is attached to Ewan Burns Hairdressers in Keyworth on the small strip of shops opposite to the St Mary Magdalene Church. I didn’t realize that there was a small café attached until the warmer weather arrived and the tables and chairs appeared outside on the pavement. That turns it into a nice alfresco spot to sit for a sandwich and a coffee. 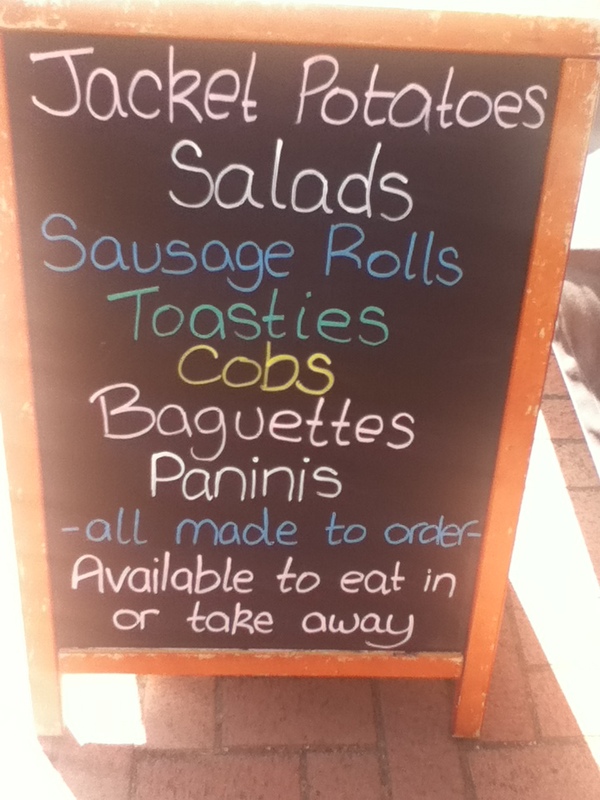 Ewan Burns chalkboard has most of your typical lunchtime sandwich shop options, there is nothing too complicated or scary, basically you can get a sandwich, baguette, Panini, or jacket potato all with any of the standard toppings or fillings such as ham, cheese, egg, chicken or similar. The only two that stood out for me were the coronation chicken, and the chicken tikki. 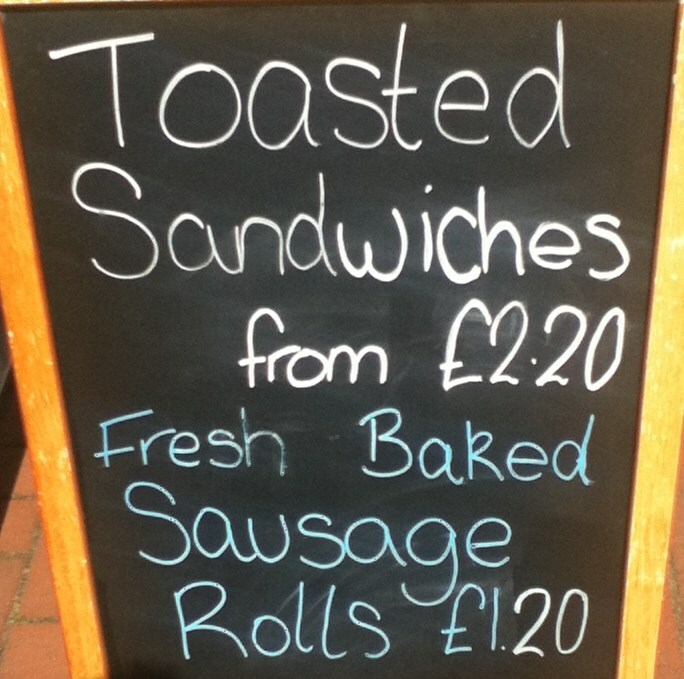 There was some small promise on the board inside of bacon and sausage, but on the two occasions that I have been in at lunch they have already sold out of the breakfast type fillings. 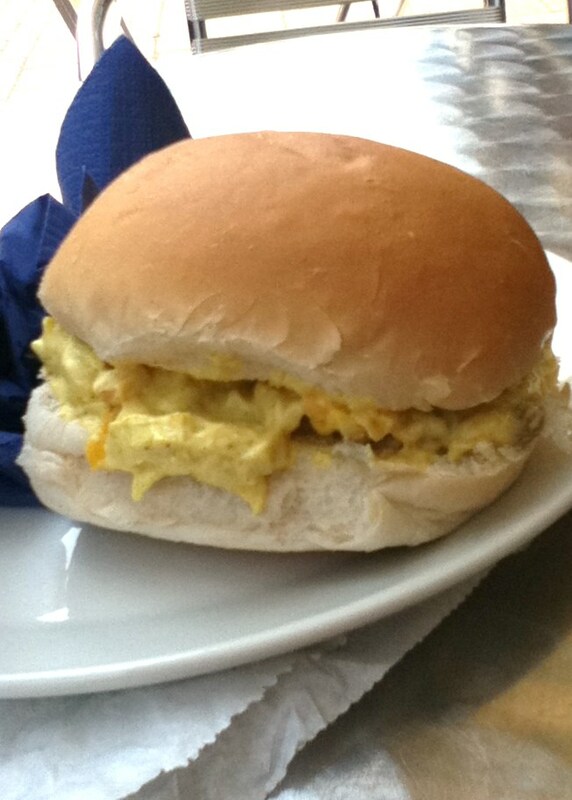 That was fine with me as one of my true loves in a sandwich is that most English of Indian creations; Coronation Chicken. I ordered up one of these in a soft white Cob. It was filled with plenty of chopped chicken breast smothered in a creamy coronation sauce interspersed with sweet sultanas. The sauce was so yellow that it stained my fingers, my chin, and sadly the shirt that I was wearing. I should have learnt by now not to wear anything white when eating any sort of curry dish. On my second visit to Ewan Burns I meant to order another Coronation Chicken Cob and I had worn dark clothes for the occasion. For some reason the words Chicken Tikka came out of my mouth instead, so I had a Chicken Tikka cob instead. It was just as tasty but very mildly spiced. The most random of things was that I was asked if I wanted the side salad, in the end that turned out to be some spicy bits of crisp. It was still quite nice. 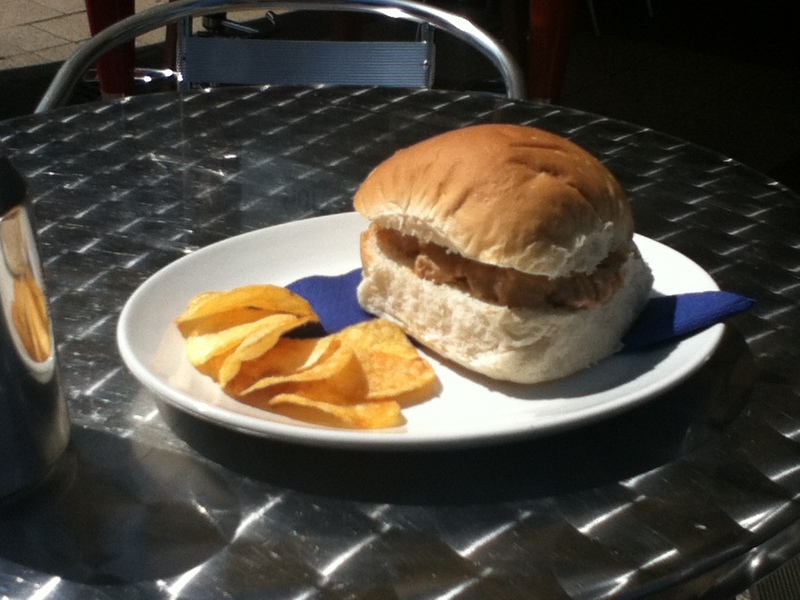 The prices are cheap, the staff are friendly and the Coronation Chicken is the thing to get! 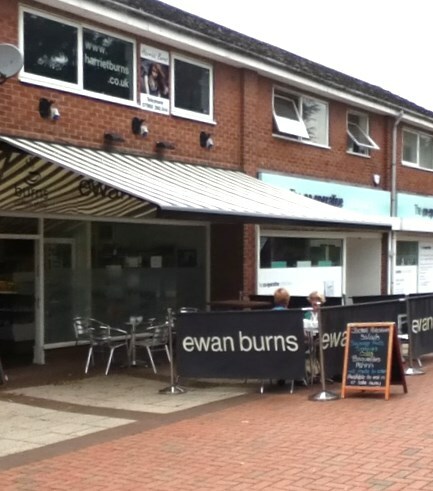 Ewan Burns is located at 6 The Square, Keyworth, Nottingham NG12 5JT. The Keyworth Connection Bus stops about 15-20 yards away, and there is plenty of free parking in the nearby car park. Maybe you should contact Ewan Burns. What did it say?